I am in looove! These stuffed shells are a total delight! Yum! I love stuffed shells, but I never even considered butternut squash. Weird, since I make ravioli with squash. This looks like much less trouble, and lots of flavor! This looks fantastic--beautiful photo! I love lasagna as well but I rarely make it due to the work involved. Stuffed shells on the other hand, I make all the time. Can’t wait to try these! My family usually does lasagna for Christmas but I might just have to change it up this year. These shells look too good not to! 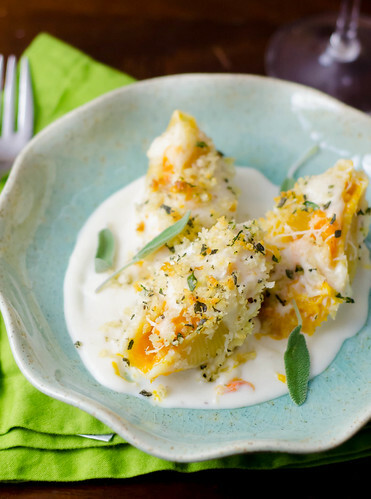 Love stuffed shells and butternut squash and goat cheese sound like such a good combination. Yum! Squash and goat cheese are a match made in heaven! I haven't made stuffed shells in years. This looks like it would make an amazing dinner! theses looks so beautiful and moutwatering. Beautiful! I can almost taste how delicious these would be from your description. Can not WAIT to try this. I JUST made butternut squash stuffed shells with sage, but now I must try this! I bookmarked this when you posted it and after finding an unopen box of jumbo shells in my cabinet I decided to try this out. Delicious!! We had them last night and I just heated up some leftovers for dinner tonight. I'll definitely make this again. i made this last night-- sort of.... No shells at the store, so I did a lasagna version. I added in a layer of spinach. I used parmesan and gruyere and goat cheese. It was AWESOME!! I have enough chicken stock to last several weeks-months. And by the time I deplete my stash, I essay writing in united states usually have two more chicken carcasses in the freezer to use.